Sign up and receive Property Email Alerts of Houses for sale in Aegean Heights, Langebaan. A Immaculately Situated, 4 Bedroom, 4 Bathroom Beachfront Home for Sale in Aegean Heights Langebaan. It is often said that there are only three things to consider when purchasing property. Location Location, Location! Inspired by the Greek villas of Antiparos. Dramatically situated on the rocks this unique location allows you to live your seaside dream! 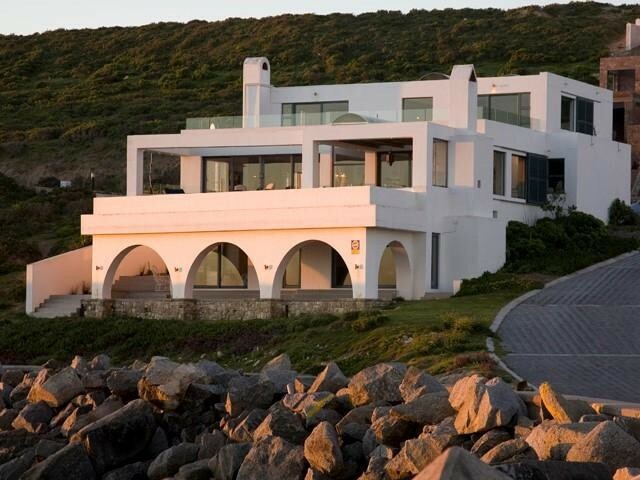 The Location of this Home allows for Panoramic Sea Views of the Atlantic Ocean and Langebaan Lagoon. This Northern Estate of Langebaan is one of the Finest Areas in town and provides a true Island Holiday like feel. The Estate of Aegean Heights Provides with a Sense of Freedom in your own Home and Cultivates Peaceful Living. South West Facing towards the Atlantic Ocean and Lagoon. Walking distance to Club Mykonos Resort and Casino as well as the Club Mykonos Marina. Stunning Sea Views from the Balconies and Pristine Beaches are Situated close by. * Dramatically Situated on the Rocks Facing the Ocean. * This Exquisite House is Designed to allow you the Privilege of having Panoramic Sea Views from Literally Every Window. * Built on Three Levels with Large Sundecks. * The Top Floor contains Two Suites with Spa Baths. * Views over the Ocean leading out to Sundecks that stretch the Entire Length of the House. * The Middle Floor contains a Spacious Kitchen with an Island and Scullery. * Kitchen Overlooks the Living Room and Dining Room with Panoramic Sea Views of the Ocean. * The Sundeck has a Beautifully Designed Lapa with an Infinity Pool. * Pool Area is Fitted with Barstools where one can enjoy sitting in the Pool while having a Cocktail. * The Lower Floor contains Two Ensuite Bedrooms with their own Private Balconies. * Spacious Study Literally 20 meters from the Waves and a Huge Cellar with Oak Floors and Entertainment Area. * The House has Under Floor Heating throughout, as well as an Elevator Connecting all the Floors. * Cellar and Entertainment Area. * Lapa with Infinity Pool and Fitted Bar Tools. * Sun Deck that stretches the entire length of the house. * Land Size 607 sqm in extent. * Building Size 420 sqm in extent. Sign-up and receive Property Email Alerts of Houses for sale in Aegean Heights, Langebaan.